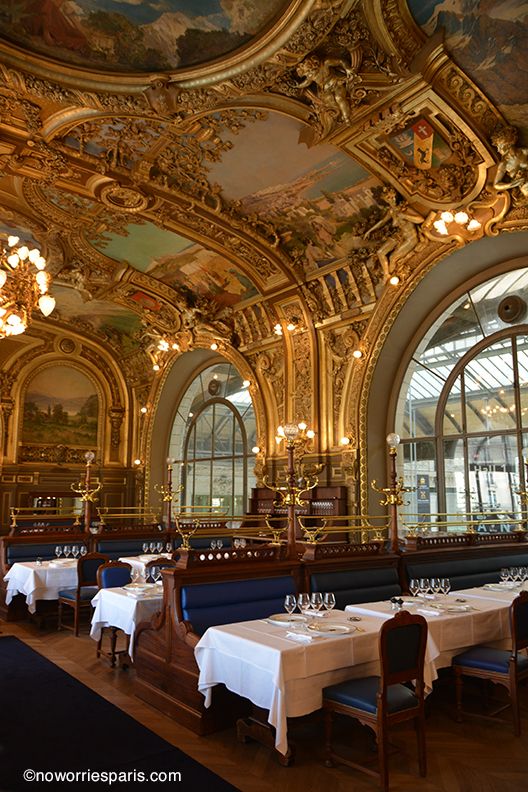 One of Paris’s Belle Époque dazzling restaurants is located in none other than a train station. A great suggestion for an afternoon is visiting the Jardin des Plantes and finishing it up with a late lunch at Le Train Bleu. 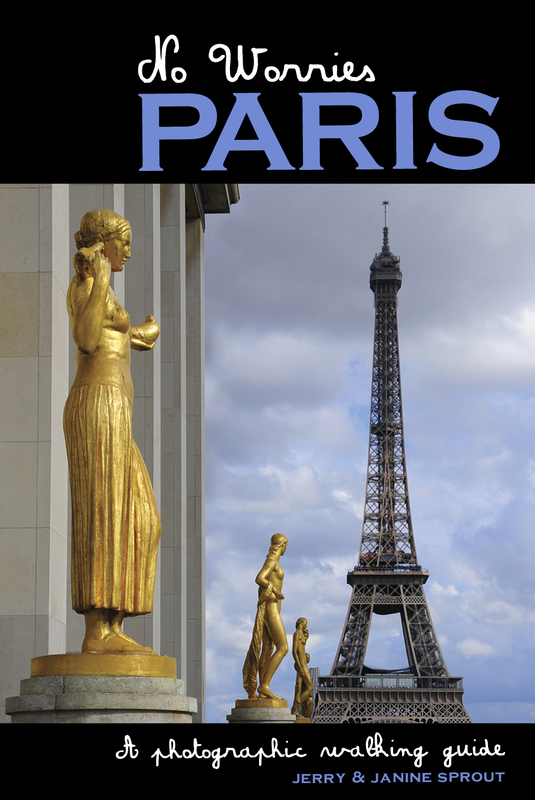 the beginnings of this restaurant are linked with those of the Gare de Lyon. 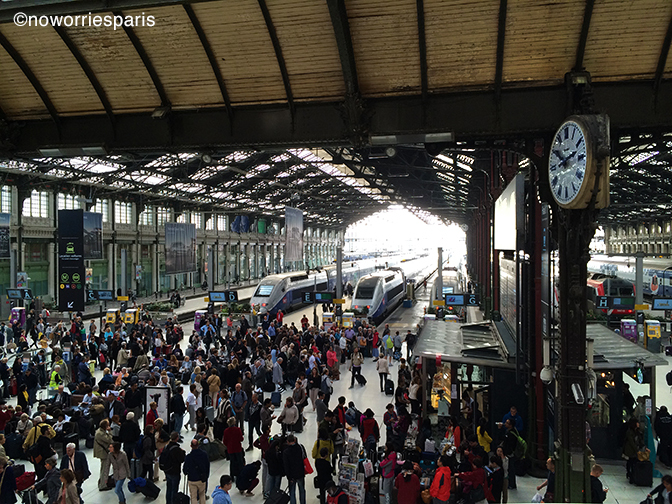 In the planning stage, the Compagnie Paris-Lyon-Méditerranée (the PLM) decided to build a new railway station with 13 tracks capable of handling tens of thousands of visitors. The station’s buffet has an immense, richly decorated rectangular dining room, basket-handle arched ceiling, Caryatides, rococo mermaids, gilding, mirrors and 41 murals painted by 30 renowned artists evoking the most beautiful French landscapes traversed by the railroad: a view of the Mont Blanc, Antibes, Marseille’s old port, the Lac du Bourget, etc… ‘No restaurant is more beautiful than that of the Gare de Lyon!’ wrote Louise de Vilmorin. Having narrowly escaped destruction by the SNCF (French national railway company) after WWII, Le Train Bleu has been listed in the Historic Monuments Registry since 1972. The TGV menu is served in 45 minutes; it consists of a slice of home-cooked foie gras, a beef steak tartare with freshly fried potatoes and a cup of coffee.’ Don’t miss the traditional baba au rhum: the maître d’hôtel sets it down in front of you, cuts it in two, douses it with rum and leaves the bottle and the bowl of Chantilly cream on your table to be used at will.